To earn the BASC Frankie Mozingo Player Award, players are nominated by their current coach each season and have met any or all of the following criteria. A player who generally stands out and represents the club in a positive way. Frankie Mozingo began volunteering forty years ago. Her volunteer career began when her youngest child’s U8 team needed a coach. Searching for knowledge, Frankie took all the state courses available and then the USSF C class. Thus began a long-term connection to the game of soccer that Frankie has never stepped away from even while facing cancer treatment. When her Broken Arrow Express ‘68 team won the state championship (the first of 5), Frankie was undergoing chemotherapy. “I believe those girls saved my life,” says Mozingo. “I would go to the games, and try to run practice, but they would often tell me to just stay home because we’ll run practice. I couldn’t stay home so I forced myself to go. I couldn’t stay home and feel sorry for myself.” Her ’80 team players and parents have also been supportive of her during these past years. At the suggestion of Frankie’s husband, Ivy, she agreed to cut back on her coaching although she still found time to hold training sessions for BASC U8 and U10 recreational teams. In 1995 Frankie was named National Coach of the Year and Olympic Development Coach of the Year in 1996. In 1999 she retired from St. Francis to enjoy her free time – volunteering. “And fishing,” she laughs. Frankie loves to fish almost as much as she loves to volunteer. She kept her referee license current and officiated matches when she was called upon. “When I was growing up parents did things for their kids and I think we need to continue that concept,” says Frankie. She also thinks that volunteering means not getting paid to do those tasks that make a non-profit organization work. “I was never paid to coach, and I didn’t expect to be.” In 2010, Frankie was awarded into the Oklahoma Soccer Association’s Hall of Fame for her dedication to soccer in the state of Oklahoma. Frankie has recently enjoyed watching her grandkids play and officiate at ISSC. 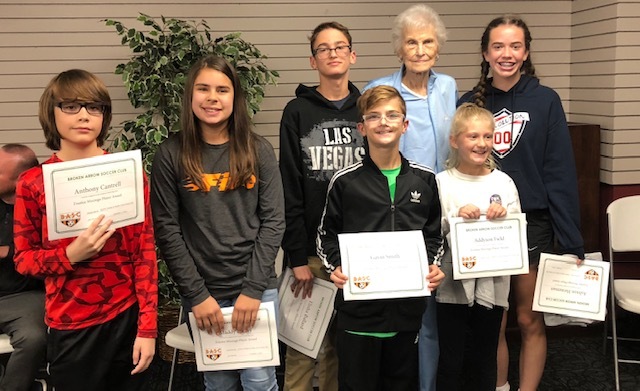 Frankie has certificates from her coaching classes and state championship titles for her walls, but mostly she has fond memories of her teams, the parents, and the members of Broken Arrow Soccer Club. “I stick around because I enjoy the kids and soccer people are good people,” says Frankie.